St Michael's School, probably shortly after it was finished in 1913. This picture was found on ebay and I thank the seller for sending me a scan. 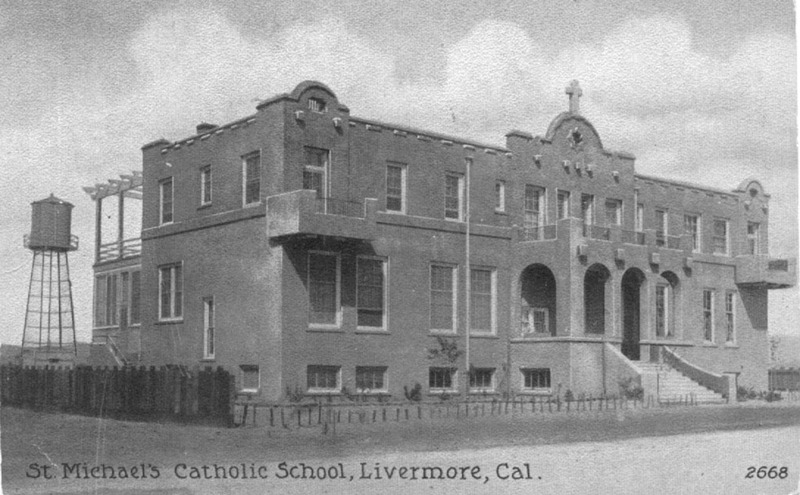 The Livermore Heritage Guild 2003 Calendar includes a picture from the dedication of this building (which they refer to as "St. Michaels Sister's Academy"), dated 21 September 1913. There are no trees yet planted in front of the school in that picture. To find class pictures from St Michael's School in the archive, see Livermore class pictures listed by school. And if you have any pictures of or from St Michael's School that you would like to share, please submit them to the Archive.